The Best Steaks for Grilling. Period. Everyone knows there's no special occasion required to put a nice steak on the grill. 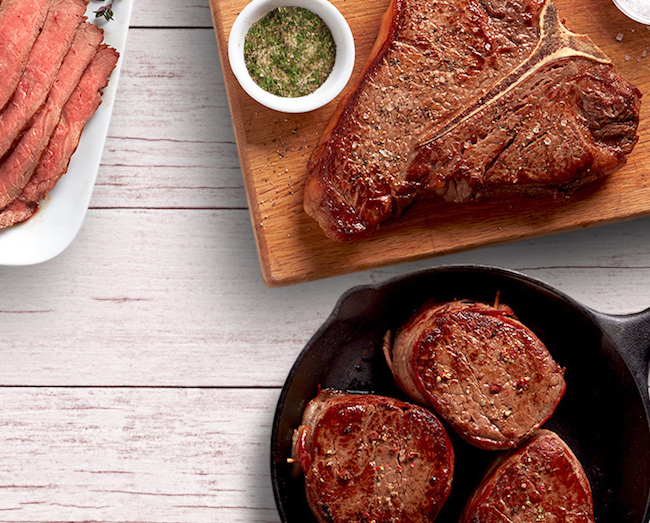 Ask your Hy-Vee butcher or chef which steak is their favorite, and you'll likely get one of the below options. Boneless sirloin is a lean but flavorful cut that's even better when marinated before grilling. It's also good for kabobs. The tenderloin is, as you might guess, the most tender of the all the cuts. The popular filet mignon steaks are cut from the center of the tenderloin. Even though it's a leaner cut, it's known for it's buttery texture. This meaty, well-marbled cut goes by other names, such as Kansas City steak or strip steak. We like to buy the 12-ounce steaks and split each one for two people. One 3-ounce serving of New York Strip Steak contains 49% daily value for protein, 10% daily value for iron and 30% of the daily value for zinc. The T-shaped bone divides two different cuts: New York strip steak and filet mignon. A porterhouse is simply a T-bone with a larger portion of filet mignon. Generously marbled, this bone-in steak is from the center of the prime rib. It's the juiciest, most flavorful, and perhaps most favorite steak for the grill. Hy-Vee Chefs show their university spirit with these school-inspired chilis. Hy-Vee grill masters share their best tips for grilling beginners and beyond.